Do you ever get in a quirky mood? The boys and I thought we would try something new for lunch. We are stuck in a rut and needed to break the cycle of tuna sandwiches and ramen noodles. Egg and Hash Cups fit the bill- not for exotic ingredients, but for the presentation! We found this fun recipe in a cookbook that we use for camping. I use it for several recipes on family camp outs from Full Circle Dutch Oven Cookbook by the Patrick Sisters. I love using our dutch ovens, but a lot of the recipes are easily adapted to a conventional oven. Place foil liners in the muffin tin or on a cookie sheet. One can will make about 6. Gently spray the inside of each liner. Fill each cupcake liner almost halfway with the hash. Crack an egg and cover the hash. Cook in a 350 degree oven until the eggs are firm and cooked through. Happy Fourth of July! Our cat is even wrapped up in the festivities. Hoping everyone has a safe and fun Fourth! With that mantra, it's a bit distressing when my craft cupboard runs bare and there are no sparkles to be found anywhere. When that happens, I resort to making colored salt to use in place of glitter. It twinkles and gives your crafts a bit of shimmer without breaking the bank. First, put the desired amount of salt in a baggie. Second, add a drop or two of liquid watercolor or food coloring. I prefer watercolor, but that is only because it is washable. Third, seal the bag and knead the salt and coloring together. Do this until the coloring is evenly distributed. Finally- create! We used this batch for 3D Firework Art! It's that time of year again- when booms echo and flashes of color fill the night sky. I knew it had arrived when the firework ads came tucked inside the local paper. These innocent pieces of advertisement are eye candy for the little pyros I call children. Coupons, BOGO's, and more laying there for the children to ogle. They sit and meticuosly plan how they are going to spend their pennies and saved money. The boys know every price from memory and know exactly which tent houses the cheapest sparklers or artillery shells. However, this momma has a short fuse and doesn't want to imagine the final cost of these "so-called" bargains. Years ago, the food program my daycare uses provided a fun craft in their monthly newsletter. This is one of the most fun Fourth of July crafts I have stumbled upon. It keeps the pyros in the family happy and allows me one hour where I don't have to hear pleas to buy more parachutes. To make 3D Firework Art you will need a few items. Although, due to dire craft supply shortage, we had to get creative by making an alternative to glitter using salt. Get creative and let your little ones create their ideal firework display minus the booms and high costs. On your black paper, use glue to draw shoots and explosions in the night sky. Sprinkle glitter over the glue and shake off the excess. Now it's time to add your 3D stars and blooms. Take your pencil and place the square of paper around the eraser. Pinch around the end and press it onto a dab of glue. Carefully, remove the pencil and VOILA! Let the paper dry and display. It was HOT! So hot that the a/c hadn't stopped running and the children balked at the thought of going outside. I had implimented a $1 fine for every person who left a door open and the masses started to complain. Tempers started to flare and all the Curious George episodes on the DVR had been viewed. By then, the temps pushed over 100 and we were in serious need of some cool fun. I wasn't about to brave the sizzling concrete and crowded swimming pool, so I decided to crack out an old stand-by craft. I wanted to show the children how colors are mixed with primary colors. I had the wee beasties form dots with markers on coffee filters. Next, we added a drop or two of water. As the water spread across the filter, the color broke down. Now, they were able to see the the individual colors that comprised the original dot. However, two year olds are not interested in color spectrums or dissecting the formula for plum markers. I demonstrated a few for the older boys and handed over the water. They all created beautiful "stained glass" images. The children enjoyed mixing new colors and getting their designs to run together. I did try to keep the patterns symmetrical, by having them only color one side. Bobby pins- but a lot of people use old fashioned clothes "pins"
Take your markers to draw or dot on one side of the coffee filter. I folded the filters in half to create "hemispheres" and let the children choose which one to decorate when it was unfolded. Drop water on the colored side. Unfold the filter and let dry. When the filters are dry- scrunch up or accordion fold the filters in the middle. You are creating the butterfly's wings. Slide a bobby pin down the middle. I personally prefer bobby pins, because they are cheaper and sleeker than the traditional clothes pin. Use whatever you have on hand and prefer. For large butterflies, use two coffee filters. For small critters, use only one. Finally, attach a piece of string and hang. It's June and that means weddings... A LOT of weddings. I was in charge of decorations and catering recently for a family member's wedding. In the beginning we had originally planned on 100 people attending so we made a handful of centerpieces for each table. We placed white lilies tucked in white square boxes with a black ribbon tied around the middle. Inside we tucked small red flowers and attached one red butterfly. They were beautiful! On the night of the rehearsal the bride calculated a final tally for the guest list. Our total headcount almost doubled and that required a lot more tables. A LOT! I live in a small community and the nearest craft store or Wal-mart is almost an hour away. We were in a bind and the only stores open were the local Dollar General and Bomgaars. While the wedding party practiced at the Church, I dashed to the Dollar General to see what I could find to make more centerpieces. I did have a few leftover ribbons and flowers, but nothing substantial. What was a girl to do? Luckily, God was smiling down on me and I was able to scrounge up about 10 more centerpieces. I overturned the wine glass and hot glued the pillar candle to the base. This added height and made the candles more secure. Next, I tied a black ribbon around the candle about 3/4 of the way up. This allowed the new centerpieces to be cohesive with the existing ones we already had made. Finally, we added interesting pieces from the potpurri bag around the goblet. A few candles had roses placed inside the goblet. The candles added ambiance and additional soft lighting for the reception. Everyone commented on their elegance and didn't believe us that we found everything at the Dollar General! These easy and reusable centerpieces could easily be adapted to fit other themes and colors. 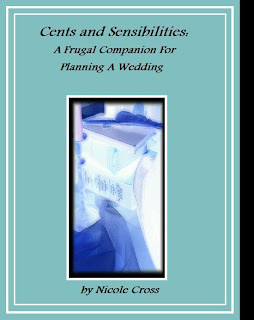 For more frugal wedding ideas, be sure to check out Cents and Sensibilities: A Frugal Companion For Planning A Wedding. Today was the official first day of summer, but the skies were overcast and promising rain. I had a house full of boys and Netflix decided to take a vacation, leaving them craving something to do. Luckily, a neighbor had some over ripe bananas that needed to be used so she donated them to the cause. The boys LOVE baking and I thought we would whip up something special. Our palates are nearing banana bread overload, so I scrounged around for an old recipe I found in a church cookbook years ago. The recipe reminds me of banana bread, but the texture is unique and offers us a new twist. These little cookies are the right size for small hands and they are so soft and sweet- Perfect for a rainy day! Preheat the oven to 350 degrees and grease your cookie sheets. Mix the bananas, shortening, brown sugar until creamy. Add 1 egg, 1/2 teaspoon vanilla, 1/4 teaspoon salt, 1 teaspoon baking soda, and 2 cups flour. Mix well. Drop a tablespoon of batter onto a greased cookie sheet. They will spread as they cook, so I spaced them about 2 inches apart. Bake them for about 8 minutes. They will be soft- not hard. You will want to keep an eye on them to keep them from burning. Prepare the frosting: Bring 6 tablespoons brown sugar, 4 tablespoons milk, and 4 tablespoons butter to a boil. Add 1/2 teaspoon vanilla and 2 cups powdered sugar. Mix and let set for a few minutes before frosting the cookies. Do you have any fun ways to use old bananas? Let's Have A "T" Party! One of my favorite preschool activities is hosting a letter "Tt" party. It's also one of our favorite ways to showcase the letter "Tt". 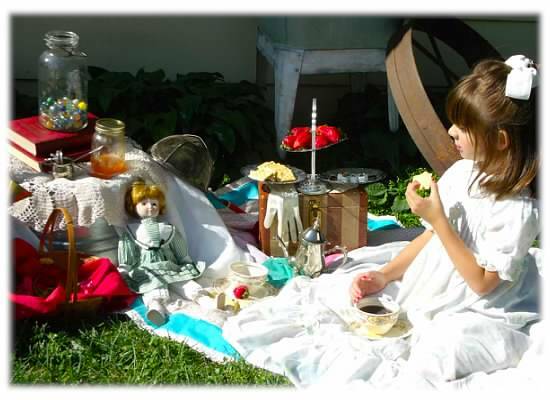 Last week, the children and I hosted a picnic tea party in our yard. We donned our old fashioned dresses and hats for the festivities. It was a wonderful time and we even took a picture of our feast to enter in a contest. It may be old school, but there is something magical about tea parties. Create invitations and have the children practice writing the letter "Tt's" on the front and their names inside. Use real tea service- the children love using "grown up" cups and silver. Serve foods that begin with the letter "T". Listed is a sampling of your delicacies: tiny triangle tuna sandwiches, Tootsie rolls, tarts, tangerines, taffy, tiny hot dogs on a toothpick, tiramisu, tic tacs, etc. Get creative! Serve sugar cubes to mix with their tea. I am probably going to get a lot of slack for that comment, but the children ADORE taking "one lump or two" and stirring their drink. It's not an everyday treat and makes this activity memorable. Dress the part. Have participants dress in their finest or furnish fancy dresses, ties, hats, and gloves for the children to don. Teach them basic manners. I know this doesn't follow the letter theme, but take every opportunity you can to emphasis social skills. Play "fancy" music faintly in the background. We have a CD of piano compositions and classical renditions we rely on. Do you have any fun ideas to teach the letters of the alphabet? I just wanted to thank God for making children washable. I would have thrown out my three sons a long time ago. 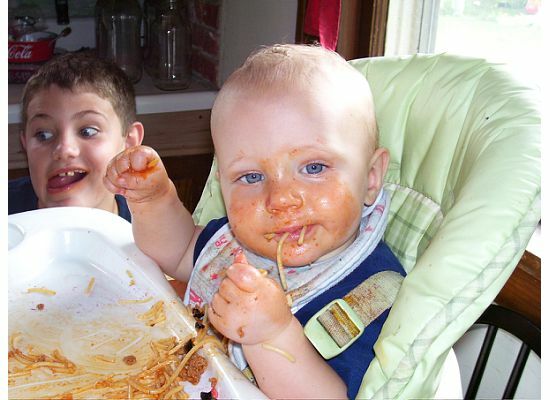 . . . .
A good meal isn't great unless a child is wearing their food. I received this wonderful card from my middle son last year. He made it at school and surprised me with it over a simple breakfast (toast and jelly) in bed for Mother's Day. I thought it was sweet and delightful. It was too cute not to share and I can credit my son's teacher with the sweet idea. I promise to make my bed every morning without complaining. This flower is good for one special chore. Present this flower for breakfast in bed. Redeem me for one night of dishes. *After your flowers are made, make your vase. Cut a simple shape out of paper and carefully glue the sides and bottom to the card. Remember to leave the top open. *Next, slip the stems into a slit at the top of the paper vase. My Mom is as sweet as ____________________________________________. My Mom is as beautiful as _______________________________________________. I love my Mom, because ________________________________________________. *Spritz with a little perfume and find a special person to deliver your card to. Tonight I had an epiphany of sorts and it all started when I sat down on the couch to feast on a reheated plate of soggy fish sticks and a frozen mojito. I lounged there in my pajamas munching the mystery fish and watching MANOR HOUSE (a series that aired years ago on PBS). It had been a typical crazy night in our house and finally, I had the boys fed and tucked snug into their beds. We had early morning activities, an early bus route, preschool, soccer games, and track practice. I was exhausted- so naturally I vegged out in front of the flickering tellie. It finally dawned on me that I was not accomplishing anything. Well, I guess I was learning a little about Edwardian underwear and exploring the plight of a scullery maid. . . BUT was I "getting my business done?" Yes, I just quoted the television series THE MIDDLE. I am not completely insane, but my sons and I watch that series every week. Last night's episode was about accomplishing tasks in your life that matter. It was a meaningful message with a sense of humor slapped on the side, but the theme must have stuck in my head. Yes, I have managed to juggle my family and keep everyone on track, but I was missing something. I know this sounds selfish, but what was I doing to get my business done? We have been doing a little remodeling and my oldest son was confirmed on Palm Sunday. I have taken a self imposed hiatus from the blogging world due to being preoccupied planning a wedding and organizing Vacation Bible School. Tonight, I have decided to saddle up and ride this horse- I mean, blog again. So now I am left to ponder the world of Upstairs, Downstairs and my next blog post topic. Maybe, it will focus on the sickening feeling I get whenever I hear Celine Dion's TITANIC love song. Really? Couldn't they find a different song for the 3D version? It was bad enough 14 years ago during the first release when all the radio stations cued up the song every 15 minutes. However, I am starting to channel my inner Bridget Jones and may need to seriously contemplate what exactly they put in a mojito. Lime and mint? These pouches are tasty. . .
What will you do to "get your business done"? One of my favorite blogs is Tip Junkie. She has a wide collection of wonderful ideas. Stop by and check her out. Right now she is hosting a link to share great ideas with each other. Free E-book for the Kindle! My first ebook is published on Amazon and is normally available for $1.00. This is a straightforward guide for pinching pennies while planning a wedding. I have also included several ways to incorporate a Regency Period/Jane Austen wedding. Check it out! It's hard to believe it's January here in Nebraska. We've had temperatures in the high 40's and even hit 70 the other day. AMAZING! This break in weather is a far cry from what we normally endure. I decided to post a simple solution that we rely on during a frosty spell and when the snow flies. A fun day spent romping in the snow is a favorite activity around these parts. Bundling up to go outside is a necessity when temperatures hover around zero, but it left us with another problem. Where was I going to store all this gear? Snow crusted hats, mittens, socks, boots, and coveralls clogged up my coat rack and almost all of the heat vents. Soppy mittens and boots were becoming a major eye sore and tripping hazard. There had to be a better solution. Growing up, we would place our frozen mittens on the old radiator heaters at school or place them strategically over a furnace vent at home. As an adult, now I had more children in the house than I did heat vents! Ugh. I won't even go into detail about how the boys would leave wet mittens in their backpacks or pockets. I was desperate- so I finagled a simple indoor drying line out of a pair of new shoe strings and an old plant hanger. Are you laughing? I attached the two long laces by knotting them around the metal hanger. Then I slid the hanger over the woodwork. You could permanently attach the hanger using screws, but I didn't want to ruin our wood or look at it for 12 months a year. Now, I have the children use clothespins to hang up their wet gloves and hats on the string. The mittens are paired and all in one convenient spot. No more searching through piles of cold knit to find a child's hat or running from room to room checking heat vents for a glove's partner. We go to the mitten line and remove our air dried winter gear. Do you have any simple winter solutions?